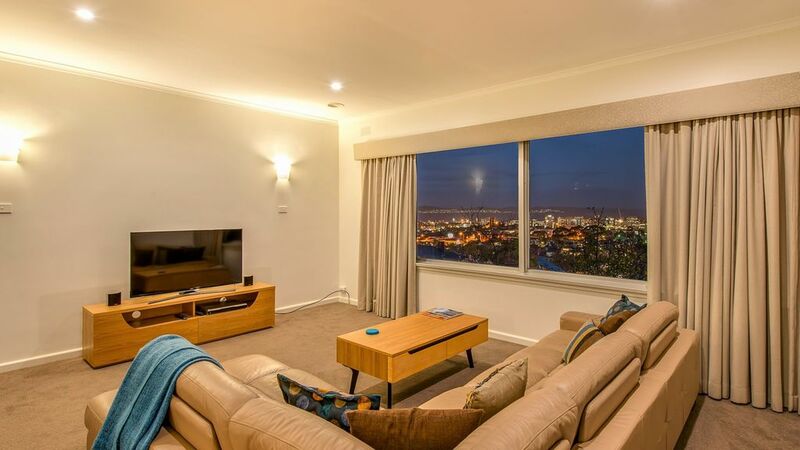 If a spacious Hobart holiday apartment with incredible views in a fantastic location is what you’re after, look no further! Whether you are visiting Hobart for a holiday, event or business, City Lights is perfect for your stay. The apartment is a 5-minute walk to the North Hobart restaurant strip, bars, cafes, supermarket and Hobart's iconic State Cinema. A further 15 minutes and you'll be in the heart of the city retail area, Elizabeth Street Mall. From here, it's a short stroll to the Hobart Waterfront where you can catch a Ferry to MONA, visit the Tasmanian Museum and Art Gallery or Salamanca Market. Families and friends can easily spread out and take advantage of the property’s versatility – there is plenty of space for guests to either enjoy their own company or to socialise as a group. Children are welcome with a variety of books, toys and games provided for their enjoyment, and a high chair and port-a-cot are available. The magnificent open plan dining/ kitchen is equipped with a large dining table, full size fridge, gas cooktop, dishwasher and microwave, as well as everything you might need to cook up a storm. That is, if you can keep your gaze from the spectacular water and city views for long enough! Step out from the dining area to the balcony to pick a lemon from the large tree or take a seat on the deck to admire the view with a fresh morning coffee straight from your espresso machine. Alternatively savour the view with a glass of wine as the sun goes down and watch the City Lights come to life. There is also a separate BBQ area outside, plus a small outdoor seating area to enjoy eating al fresco on a warm evening. If you need a quiet space to withdraw, the library offers a multitude of interesting fiction and non-fiction books to peruse. A desk is provided and offers a comfortable place to sit with your lap top as you catch up on business or pleasure using the high-speed internet NBN network. Enjoy some down time and more of those amazing views from the comfortable leather couch in the spacious lounge. Watch a movie on the Samsung SMART TV, play a game on PlayStation 2, or perhaps while away a cosy evening with a classic board game. Sleeping up to 8 guests, the apartment contains 4 bedrooms, all with robes. 3 have Queen sized beds and the 4th has a trundle bunk bed. All beds have quality mattresses, soft toppers and luxurious linen to ensure a good night’s rest. Electric blankets are provided to keep you snug year round. The master bedroom includes a walk-in robe plus renovated ensuite with shower, vanity, toilet and heat lamp. The main bathroom boasts a deep deluxe bath tub so why not indulge in a luxurious soak? Quality towels are provided for your comfort as well as toiletries in both bathrooms. Ducted heating will keep you warm throughout the apartment during the cooler months. Other notable features of City Lights include it's quiet and safe location, off street parking and generous supplies for your first breakfast. We loved our stay in this beautiful unit. Everything you could possibly want was there ( Yes! everything). Close to the restaurant strip. It was spotlessly clean, very comfortable and a delight to come back to after a long day touring Hobart and surrounding areas. A credit to the owners and we would definitely recommend if you want to stay in Hobart. To top it off - the views were amazing. Thank you for sharing this lovely place with us. Amazing views, very clean and well appointed and a perfect location. Nestled on the hillside of Mt Stuart, "City Lights" is not much to look at from the outside but once you open the door you're in for a surprise. Beautifully clean and eminently livable, the apartment has all you could need. A real home away from home. The views are spectacular especially at night, beds are super comfy and the location makes holidaying easy. An easy drive or short walk to a multitude of wonderful restaurants and cafes, and central to many sightseeing attractions. WiFi was super fast and reliable and was great to have access to Netflix for a quiet night in. Extra thoughtful touches such as the library of books and delicious provisions for breakfast made our stay even more enjoyable. Thank you Natalie. Spacious and comfortable, great location! Excellent communication throughout the booking process from manager Natalie, with very much appreciated breakfast provisions after a late arrival the previous night. The views of the city were awesome! The house is very comfortable and spacious, with a modern interior. The kitchen is very well equipped so we could easily cook meals at home. A short walk to restaurants. We had a lovely stay and would gladly return. Such an interesting property... very unassuming from outside but inner layout is beautiful and of very generous proportions. Host Natalie was very friendly and easy to communicate with, and some lovely pantry/fridge provisions were a nice touch. Very close to North Hobart restaurant strip as stated in the blurb, and a fantastic location to stay when exploring Hobart. Highly recommend!! Lovely service and wonderf location.